to buy materials to make fabric and corn to make tortillas, both to sell. Dúo Guadalupe Group benötigte 275 US-Dollar, um ein Gewerbe im Bereich Kunsthandwerk auf- oder auszubauen. Das Geld wurde gesammelt und für Dúo Guadalupe Group bereitgestellt. 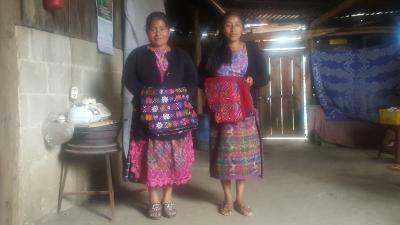 Duo Gadalupe Group is represented by Adela, who is from the city of Tecpan. She is 36 and has three young children. She makes a living making traditional woven fabric by hand and selling tortillas. She puts a lot of effort into making these products. She is a hard-working person who fights every day to help her family progress. In the morning, she weaves fabric and midday, she sells tortillas. These two activities help her family progress. Thanks to her husband's support, who works as a day laborer, she is able to keep her business going. She is requesting a loan to buy corn so she can sell tortillas and to buy thread for fabric since sometimes she lacks the capital to keep working.